Owner met us at the parking area. This was only a very quick stop over for us en route elsewhere so probably unfair to fully judge. A simple bed for the night. Excellent location and private parking but access to the garage involved a tortuous journey through one-way streets. The room was spacious and well-furnished for a 2-star. Friendly helpful owner. central location , friendly host and good breakfast before departure. Located in old city. Loads of boutiques around. Nice lady on reception. 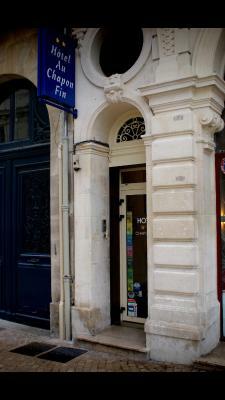 A very good location in the center of town, we had a basic room just for 1 night which was clean with basic furniture. Parking was 6 Euro for the night which was secure after 9pm. Breakfast was available (not included) Would definitely recommend. The breakfast was `ok`. Its situation in the heart of the old City was excellent. The room was in the ideal location and was a good size. There was a tv and desk and an extra blanket, which was nice. I was pleased with my room, but I am aware that some rooms are smaller so I think I was a little lucky with the size, view from the window and overall room furniture. Once you've found your way through the incredible one-way system you find a perfectly situated small hotel. Comfortable bed, sufficient bathroom. Located in a quiet district, in the city center of Poitiers and listed as a Historic monument, this former private house offers a friendly atmosphere and warm welcome. Hotel Au Chapon Fin features spacious and bright rooms, and the entire establishment offers excellent soundproofing. Two of the rooms offer views of the city hall of Poitiers. There are also 2 rooms featuring a period fireplace and decorated in a classic style. A continental breakfast is prepared every morning at this hotel and is served in the dining room. Low-cost private parking is available on site. When would you like to stay at Hotel Au Chapon Fin? This room with attached bathroom features free Wi-Fi access and views of the city hall or the courtyard. This room feature free Wi-Fi access, a TV and a private bathroom. House Rules Hotel Au Chapon Fin takes special requests – add in the next step! Hotel Au Chapon Fin accepts these cards and reserves the right to temporarily hold an amount prior to arrival. On Sundays and public holidays: 08:00 to 11:00 and from 19:00 to 21:00. Parking can be accessed via Louis Renard Street. Problem with Wi-fi. The manager tried to reboot system but it did not work. Old fashioned tired hotel, I don't think the decor has changed in the last 35 years. The bed was old, cheap and uncomfortable along with the furniture. For the same money or less you can stay at the Ibis hotel 100m away. Old building converted to hotel. Window blinds could be made more easy to use as in room was no conditioner nor ventilation for hot days. Tiny parking space for surcharge (sure better than nothing but can be used mostly by experienced drivers). One of the beds was so shaggy that cracked as soon as I sat on it (my approximate weight 12st). Just one little problem with the shower head not staying in the holder. The room was very poor, the curtains were hanging on a piece of wire and couldn`t be drawn back. The entire room needed re-furbishing, the bed was uncomfortable. Need I go on?